You know that moment when you're reading a book and you can feel it sink its claws into you to the point where you are just compelled to read it? Yeah...totally had that moment with this book. And what's sad is I could have read it last year...but instead it just sat on my shelf waiting for me to pick it up. It's time finally came, however, and now I wish I had picked it up back when I initially bought it. What a wonderful read! 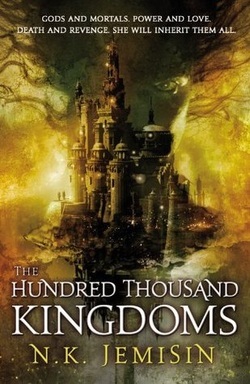 The Hundred Thousand Kingdoms is labeled "fantasy", but I might argue it's actually more of a mythology. The story follows Yeine Darr who, after living among her father's people for her whole life, is forced to travel to her mother's homeland to take her place in the succession of the nation's crown. Yeine travels reluctantly as there is no love lost between her and her Grandfather, the ruler of the Arameri nation. Once within the Arameri palace, Sky, Yeine meets Lord Nahadoth (the Dark Lord) and several of his godling children who are all enslaved as weapons to be used by the full-blooded Arameri. As Yeine cultivates complicated relationships with the personified deities and muddles through her newfound world of politics, she discovers that the path to her inheritance is much more complicated than she ever would have thought. I found the story to be utterly absorbing. Could it have been more complex and intricate? Definitely. But, for the amount of plot within the story, I thought the amount of politics to be in good proportion. It seems that several fantasy authors tend to put TOO much politics into their writing in an attempt to further develop the world. I'm not saying that approach is bad...I'm just saying that I don't prefer a lot of politics - it can bog the story down. The world building was a little weak as well and I want to know so much more about this world. I wish there was a map in the front of the book... I take comfort in the fact that this is the first in a trilogy and based on the description of the next installment, I think the world building will be expanded upon.